VisitEngland have conducted their latest quality assessment during an overnight stay on Resort and we are pleased to announce that Potters has retained its VisitEngland 5-star Quality rating in the Holiday Village category, something we've held since 2002 - that's 16 consecutive years of the highest standards in cleanliness, interiors, hospitality, customer service and friendliness. Retaining the Resort's 5-star rating is only possible due to the commitment, hard work, enthusiasm, and friendly service that each and every team member at Potters delivers. 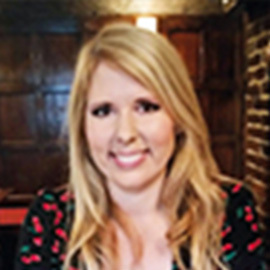 The Resort's Operations Director Kirstie Hood said that maintaining high standards for guests is so important. "The assessor was once again extremely complimentary of the consistently high standards delivered across the Resort in respect of quality, cleanliness and the friendliness of the team. Special mention was also made of our ongoing investment in the refurbishment of our hotel rooms to such a high standard." "We never rest on our laurels, and every day of the year we work hard to ensure that we continue to live up to our 5-star status, and the Potter family continue to invest millions back into the Resort every year to ensure that the Resort is at an excellent standard with consistent high levels of quality and service." Managing Director John Potter agreed that there's no room for complacency when it comes to offering top-class service and standards to the Resort's guests. 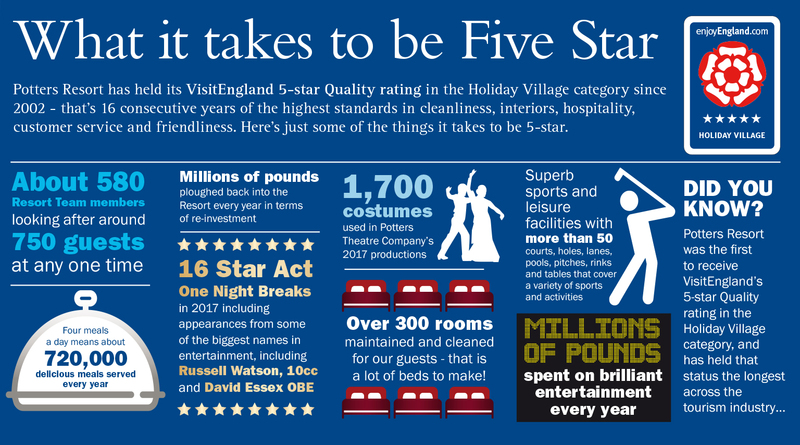 "Despite operating for nearly 100 years and being the only independent family-run Resort that offers inclusive breaks, we never rest on our laurels when it comes to customer care, guest entertainment, service standards and investment." "The guest is at the heart of the Resort, and our aim is to keep making every guest smile and offer them great value. 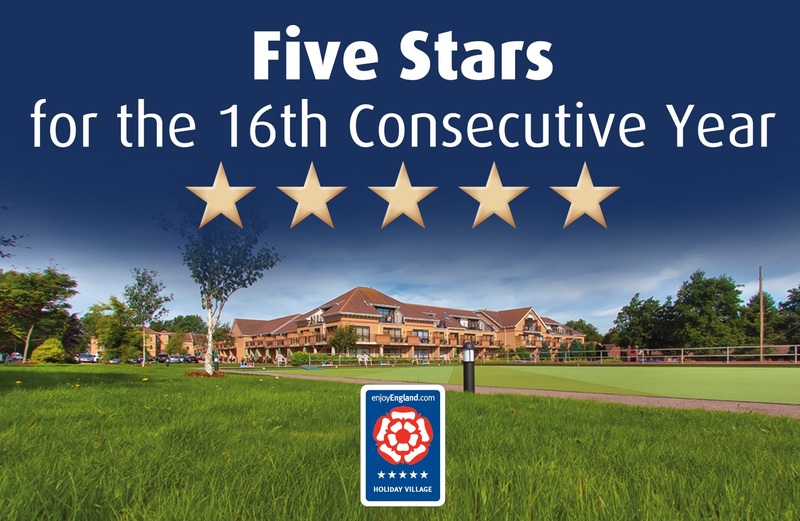 Retaining our 5-star rating is only possible due to the commitment, hard work, enthusiasm, support and friendly and personal service that each and every team member consistently delivers." "Every member of our team helps us to retain our 5 stars by providing guests with a memorable and remarkable experience, and going the extra mile to deliver this. Thanks to our team we are known for our excellent and friendly customer service, something guests always comment to me about when I see them, as well as on our feedback forms, and on sites like Facebook and TripAdvisor." Here are the some of the comments the Resort and its breaks have received on those channels. "An absolutely fabulous place. So much to do all day, every day. The evening entertainment is second to none. First class and very professional. Highly recommended! Thanks, Potters!" "You can't find fault in Potters. The hotel, bungalows, staff, food, the entertainment team and not forgetting the shows! Wow! West End production values. We've had a fabulous break. Looking forward to going again." "Had a lovely weekend with the family, getting over an operation, loved the family feel amongst all the staff, and the Entertainment team are the best I've seen in a long time, and when it comes to the activities, you can do as much or as little as you like. Fabulous." "We visit every summer holiday to spend time with all our family. Once again this year the experience has been brilliant. Everyone in our family and children loved every minute of it. Until next year, thank you to all at Potters Resort." "Back at Potters again and as usual we had a fantastic time. The choice of food and entertainment were both great. Lots to do during the day and night. The staff were as friendly and helpful as ever. The mixture of in-house and external entertainers was good. It is nice not to be ripped off with drinks prices which I have found at many other venues." "We booked Potters early in the year looking for a more upmarket Family Resort, and we weren't disappointed. In fact, it was even better than we expected. From the moment we arrived until the moment we left we had an amazing time. The staff at Potters are outstanding. They are really friendly always with a smile. Nothing is too much trouble. They work really hard, especially in the restaurant, but still have a smile and are genuinely interested in chatting to you. A lot of people at Potters are returners and we are joining that group as before we had even left the resort we'd booked to come back! That speaks for itself. Go to Potters - you'll love it!" "Potters was amazing. Great location with so much to do on the resort or in the surrounding area. Accommodation was excellent, food was lovely and so much of it, and the entertainment was brilliant. The staff are obviously well-trained and nothing is too much trouble. They all appear to have a shared vision of ensuring everyone has a great holiday. Well Done Potters!!! We take our hats off to you all!!"